The wine industry, like the a vineyard itself, is a deceptively delicate ecosystem. A shift in one area can threaten the whole. A streak of terrible weather in one region trickles down, leading to slashed revenues and lost jobs. Same goes for the industry: If one sector changes dramatically, others are materially affected. A glance at the numbers puts the industry’s challenges in stark relief. The number of U.S. wineries has risen sharply recently, from around 1,800 in 1995 to 9,645 as of December 2017, according to Wines Vines Analytics. Distributor counts, however, have gone in the opposite direction, shrinking from around 3,000 distributors in 1995 to around 1,150 or so today. The math has changed dramatically in a relatively short time, and there are no signs that winery growth or distributor consolidation is slowing down. While much media attention has been focused on the larger mergers, there appears to be as much frenzied M&A activity among smaller distributors. Over the past few decades, wine sales have grown significantly in the U.S., to a total retail value of $59.5 billion in 2016, up from $12.2 billion in 1995, according to the Wine Institute. McMillan predicts a 4 percent to 8 percent growth rate for this year—which is at least 2 percent lower than it has been lately. 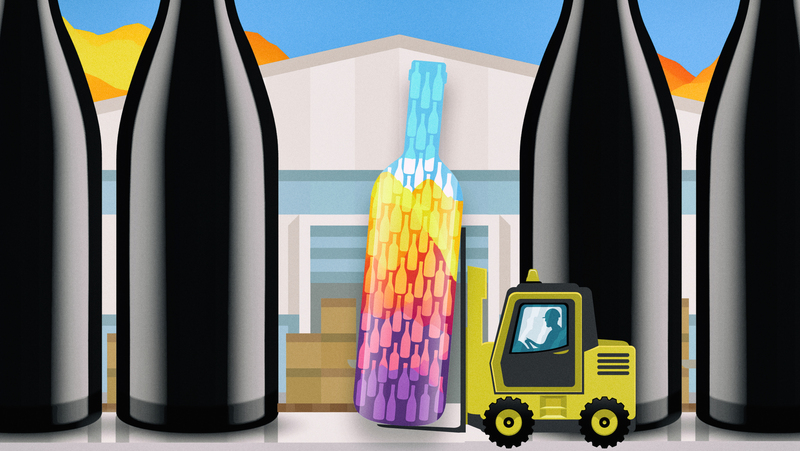 A reckoning appears to be taking place on all levels—at distributors and wineries. While boutique wineries are launching all the time, larger domestic wineries are consolidating. In 2016 alone, Jackson Family Wines snapped up Penner-Ash Wine Cellars and Copain; GI Partners gobbled up a majority share in Far Niente Wine Estates, Nickel & Nickel, Bella Union, EnRoute, and Dolce; and E. & J. Gallo bought Orin Swift Cellars—among others notable acquisitions. “If a distributor suddenly has 1 million more cases to hold and move,” Thach says, “that creates a host of issues just in terms of warehousing space and transportation.” Instead of taking the costly and time-consuming step of building out their infrastructure capabilities, companies expand their capabilities by merging with distributors. The reverse scenario also holds true: If a distributor needs access to more inventory to compete more effectively in a certain market, merging with another company is the fastest way to achieve that goal. Headlines about consolidation among the larger distributors have dominated the wine trade for years. Currently, four distributors control about 60 percent of the market: Southern Glazer’s, with $16 billion (29 percent); Breakthru Beverage Group, with $7.2 billion (14 percent); Republic National Distributing Company (RNDC), with $5.8 billion (11 percent); and Young’s Market Co., with $3 billion (6 percent). The Big Four are themselves the result of mergers, most notably the 2016 merger of Southern Wine & Spirits and Glazer’s, which formed Southern Glazer’s Wine & Spirits. Southern Glazer’s distributes more than 150 million cases of wine and spirits annually, employs more than 20,000 people, and has operations in 41 states and the District of Columbia, as well as in the Caribbean and Canada. It’s also a state where mammoth distributors dominate the market. Southern Glazer’s and RNDC lead the sales landscape, followed by midsized distributors like Pioneer Wine Company and Favorite Brands. Supercharging growth was also the goal of Matt Guerriero, a co-owner of VinMarket Selections, headquartered in Denver. VinMarket opened in 2013 but found that organic year-over-year growth wasn’t going to deliver the scale necessary for it to thrive in the competitive Colorado marketplace. VinMarket and Serendipity are hardly alone. Among other recent deals, Domaine Select Wine & Spirits acquired Il Castagno and Unity Selections to form Local Merchants of Colorado, and Baroness Wines and Volio Vino of Colorado also merged. Healthy smaller-scale distributors with complementary portfolios may stimulate stronger growth by teaming up: It’s hard to argue against less overhead and a more robust and connected sales team. But where does that leave the wineries? McMillan notes that the online market requires less overhead, and it opens the door to consumers in more locations. “[Online sales] will be the fastest-growing channel for the wine market, for sure,” McMillan says. “The industry has to make the mental switch from saying ‘This is impossible’ to ‘This is inevitable.’” Data backs that assertion. Direct-to-consumer sales represented 49 percent of wineries’ revenue in 2012, and 61 percent in 2017. As the wine sales ecosystem continues to evolve, certain wineries and distributors are adapting better than others. Some may watch sales stagnate, while others pursue new deals to help them better compete in the rapidly changing marketplace.